As a therapist, listening to the podcast provides perspectives and topics that help personally and professionally!! I love this podcast and the nuggests of wisdom and healing that Davia gives us. I recommend it to anyone who is seeking revelatory information and honesty that we don't often get from family and friends. And be a real one and follow Redefine Enough on Instagram because Davia also reviews mental health books that are great accompaniments to the podcast. I really like this podcast. The episodes are relatable and Davia has great guests who arenât afraid to be transparent. Iâm looking forward to future episodes. This podcast is such a balm! Davia is brilliant, funny, wise and overall excellent. In addition to getting insight about mental well-being, I always learn something new. Iâm so thankful to have found it! 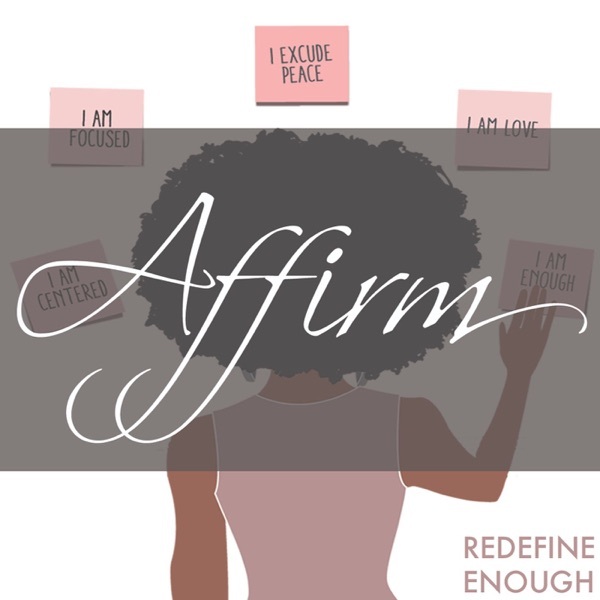 The affirm podcast is great resource for topics related to mental health and wellness for women of color. It usually feels like a relaxed and informative conversation. Davia is an engaging host who is intentional about the work she puts out. You can tell that she puts time, effort, and thought into each podcast episode. She find ways to continue the conversation from the podcast on Redefine Enoughâs Instagram page. She is also really funny, realistic, and aware of other peopleâs concerns/point of views. She talks about how certain situations could differ among people based on various identities. I often find myself laughing, nodding, saying âyes,â and learning a lot throughout each episode. She has guests on the show to bring in other points of view. I remember on one episode she said that she selective about the guests that she has on the podcast as a way to make sure that the podcast remains a safe space. This showed me that she that truly values the quality of her work. Setting Intentions all 2019- Kierra P.
Listening to this episode was affirmation that I made the right decision to walk away from everything that wasnât aligned with my purpose. My intention for 2019 is to be fulfilled and keep my mental and physical health balanced.âWho do want to be versus what do you want to do?â This question stuck with me. And I will ask myself continually as I transition into 2019.Thank you! This is a great podcast. I love the perspective and the connection between host and guests. Keep us the good work! Binge listening this podcast! Absolutely love it. So I just was looking to a podcast that spoke to me. I went all the way back and listened to the first episode... Iâm crying as I am sitting in the parking lot of my job. This right here, being Black and Mexican taking care of everyone, working, struggle, late 20s, trying to figure out life is hard. Thank you for easing the load for me even if it is for 28 mins out of my day. I am about to binge so hard. Iâve learned so much from Davia and love what sheâs doing because I canât think of any other womxn of color whoâs talking about mental health in regards to womxn of color, besides Alex Elle. Well done and I hope you continue to grow! I love this podcast and how safe it makes me feel! Davia speaks with an authentic voice that I find practical and relatable, not only for women of color, but for people in general. Even though she has the credentials to back-up what she's discussing, she often prefers to draw from her real-life experiences in delivering her point and finding connections with her guests. When I listen to her show, I feel like I'm sitting in a lliving room with Davia while having a genuine conversation over a drink, and leaving that "space" with a piece of valuable insight applicable to my personal life or in my work counseling others. Last fall I came across this podcast and I am so grateful that I did. I have learned so much and I have felt so encouraged in this space for women of color. The Affirm podcast manages to read my life all the time but I know this is exactly what I need. Are you looking for an app to make you feel validated, awakened, and revived? Look no further than AFFIRM. As a black woman fighting to make wellness more relatable and self-care less of a gimmick, who is ready to have the hard conversations, I listen to AFFIRM on my way to my full-time job or when I just need to snap back to reality. Youâll find yourself applauding, crying (trust, itâs happened), and laughing out of the joy that someone just gets it and gets you. A podcast that focuses on putting WOC in a better headspace. Subscribe, start from the beginning, and thank yourself later! Davia voice is so soothing. Thank you for helping me through my journey of self-discovery and healing. I am so grateful for Davia who is doing this incredible work and holding space for us who desperately need it. I love the episodes with guests & how lovingly they interact, but I love the episodes with just Davia as well because her voice and energy exude calming love. I just got into podcasts & I am hooked. This is really affirming and uplifting & helps me look at things from a different perspective. I'm a fan for life. Iâm so glad I found this podcast. It has been helping me understand what Iâm feeling so much. Itâs so warm and inviting I feel like sheâs in the room talking to me. Episode 8 put the icing on the cake for me, Thank you so much. So glad I came across this!! We need more spaces for US...just for us lol thank you! Keep up the good, thought provoking and motivating work!! I listened to one interview today and I am so pleased that this is a huge step in removing stigma around mental health. I'm going to keep on listening. While we live in a society where self-care seems to be a trending topic, Affirm affirms the realness of why taking care of ourselves in every aspect of our health is important. I am so glad that this podcast exists. This space has been such a blessing for its realness, relatability, and the useful information. Davia is so real and funny that it feels like I'm just sitting and listening to a friend encourage me. She challenges her listeners to care for themselves and rethink how women of color perceive mental health and come to our own experiences of mental health and wellness. Her guests are really cool and inspiring and she's not afraid to engage in difficult conversations with them. Definitely a feel good/gut check podcast for when I want to not talk and just listen. This podcast gets to the heart of modern women of color and the real life issues they/we face. Davia has the most gentle voice and soul and makes it easy for the interviewee to open up and get real. Thank you, such a joy to see the taboo of mental health being broken. I am HOOKED! It feels great to have a space where we can discuss mental health and womanhood. As a young black woman these two have been my greatest struggles. I'm looking forward to the next episode!